The first flag for the Republican movement was the blue sky, white star flag. A simple blue banner, with a white disc surrounded by 12 points. This proved popular, and was adopted by the military wing, and a modified version was assigned as the emblem. In 1906, this was placed on a red banner by Sun Yat-sen in the Summer of 1906. The Revolution itself broke out in 1911, with various factions fighting under various banners. One popular banner was a horizontal banner with 5 bars of red, yellow, blue, white, and black. It was supposed to represent 5 ethnic groups in China. However, it was not so popular with the hierarchy, as it implied that the new China had a hierarchy. Something they where fighting to overthrow in the old monarchy! President Yuan Shikai took on dictatorial powers in 1913, and forced other political parties out of China, and the KMT ended up in exile in Japan. During this time in exile, the current flag was adopted as the new flag for China. However, it took until 1928 for the KMT to finally topple the dictatorship. In the late 1940's, during the Chinese civil war, the Communists forced Chiang Kai-shek and his government to flee, and they ended up on the island of Taiwan where they set up a government-in-exile. 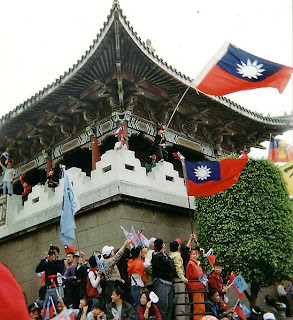 Because of both parties claims to being the legitimate government of China (most recognise the PRC), Taiwan suffers from a lack of diplomatic recognition. And also, it cannot call itself "China" for sporting events, nor can it call itself "Taiwan." It has never formally declared independence from China to do so, and should it, there is a high possibility that the PRC would act militarily to claim the island back. 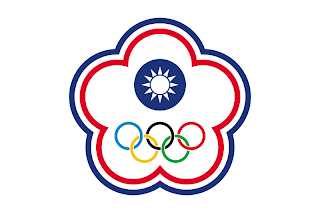 This means that during sporting events, any team from the island has to compete as Chinese Taipei, and does so under the nations Olympic flag. Taiwan is a nation that is struggling to decide which way its path should be. Its politics are split between pro-independence camps, and parties that favour stronger relations with China. Even possible reunification one day. But only if they can keep many of their democratic rights. It is going to be interesting to see how it pans out for this small island nation.